When David Harpin agreed to teach an online course for Hopkins, he did it mainly to push himself to learn new technologies. As it turned out, new tech skills were the least of what Harpin gained during four years as an Ancient Greek instructor for the Malone Schools Online Network. Using live video conferencing to teach students from Hopkins alongside students from far-flung schools has transformed how Harpin now uses his time in a conventional classroom. Harpin, who serves as the Hopkins dean of academics, is one of four Hopkins faculty members since 2013 who have offered students from other independent schools the chance to join their courses in Ancient Greek, Arabic, Chinese, and physics. Hopkins students, in turn, can take classes with online teachers from any of the 22 schools that constitute the Malone Schools Online Network (MSON). Unlike some online courses in which participants cover material whenever they wish, these are conducted face to face, via video conferencing. Harpin says it was the reduction in face-to-face instruction time that made him change his approach to teaching. He was accustomed at Hopkins to three or four 55-minute classes per week (depending on the week); MSON classes meet for an hour twice a week. He was losing 72 minutes each week. He had to make every minute count. “They don’t need to be hearing me lecture in class,” he told himself. He recorded 5- or 10-minute videos to teach basic grammar and usage; students could watch them at home (and rewind to review if they chose). This fall the MSON catalog lists 38 classes, with an enrollment of 243 students. Those students will log on from schools from Los Angeles County to Portland, Maine; and from Minneapolis to Fort Worth. Some of the courses keep alive subjects that would not draw enough students in one school to justify offering a class. This applies to Ancient Greek at Hopkins: the class survived last year because two students from other schools joined the two Hopkins students who signed up. This year, Hopkins teachers will teach online courses in first- and second-year Arabic and fifth-year Chinese. In turn, Hopkins students may attend those courses and any others on the network. Some of the courses in the MSON catalog are advanced, including multivariable calculus, advanced microeconomics and quantum physics. Others focus on topics likely to appeal to just a few students. New courses this year include a “journal club” in which students will read and analyze scientific papers, and “American Voice, American Speech: Word as Action from Anne Bradstreet to Donald Trump,” which will explore “voice” in American music, art, film, advertising, TV and politics. A teacher from Canterbury School in Fort Wayne, Indiana, will teach introduction to music theory. “We have a number of serious musicians coming through,” said Janet MacKay-Galbraith, and a jazz bass player requested the class. Sometimes a teacher initiates a class on a topic that he or she wants to explore. In this vein, Aaron Lehman at Porter-Gaud School in Charleston will teach classes on literary Modernism and Ulysses. “If novels were mountains, James Joyce’s Ulysses would be Everest,” Lehman wrote in the course catalog. Students take exams with proctors at their home schools, and teachers can embed quizzes in videos. When multivariable calculus teacher Josh Link of Maret School realized that some of his students weren’t all watching homework videos, he inserted questions that the students must answer while viewing them. Students can post their own questions for the teacher. “It gives me really great feedback,” Link said. He can also see whether a student has raced through a ten-minute video in 11 minutes. Perfection is not the goal when making these short videos, says physics teacher and Director of Academic Technology Ben Taylor, who serves as the Dean of Instruction for MSON. “I intentionally try not to over-sterilize my recordings anymore,” he said. “The students’ attention is better, their recollection is better, and their amusement is higher when they can hear background noise, hear your dog barking, hear your daughter whispering ‘Can I have a Popsicle?’” The students will want to know the dog’s name and whether Dad said yes to the Popsicle. When Hopkins teacher Farha Mohamed greets her Arabic students onscreen at the beginning of each week, she takes five or 10 minutes to ask them what they did during the weekend. Once, when a Hopkins student reported that she’d gone to Manhattan, a classmate from Indiana complained:“You guys all live in cool places. I live in a cornfield!” Mohamed uses those social conversations to convey to the students that “it’s not all about knowledge. It’s also about my connection to the student as a person.” By the end of the term, the nine students taking her course felt so close that during the final class, some of them cried. Taylor envisions a broadening role for MSON. He is Dean of Instruction for the consortium, which is funded by the Malone Family Foundation. This summer all the new teachers for the consortium met at Hopkins for training, and Taylor said they had lively conversations about teaching that might not occur among faculty members who sit together at lunch day in and day out. “Sharing classes is a cool thing, but it’s just a start,” said Taylor. Clare Chemery ’19 “The videos were a great resource,” said Clare Chemery ’19, who started her Greek career in Harpin’s MSON class and has gone on to complete Greek IV. “They were very clear and explained the topics beautifully, which is difficult, since many grammatical concepts in Greek are not used in English, like the middle voice, which is reflexive, between active and passive.” After watching the videos, she said, “We would come in fairly confident with the topic.” During class time they did exercises, read stories, and did sight translations. Abby Miller ’18 took etymology of scientific terms with teacher David Seward of Winchester Thurston School in Pittsburgh. Miller drew upon her six years of Latin and learned some Greek. too. She was the only participant from Hopkins in a class of six students from four schools. “People might be a bit turned off by the idea of interacting with the teacher via a screen, but I think it was just as rewarding, because it’s all about the content,” said Miller. Lisanne de Groot ’16 The network allowed Lisanne de Groot ’16, to take two advanced chemistry courses. By senior year, she had finished all the chemistry classes available on campus. “I love chemistry, so I wanted to keep going,” said de Groot, now a junior at Carnegie Mellon. She took MSON courses in organic chemistry and advanced topics in chemistry. For both, the teacher was David Walker from Maret School in Washington, D.C.
Last year, de Groot was debating whether to change departments at Carnegie Mellon, from materials science and engineering to natural sciences and chemistry. She called Walker for advice. Her new major focuses on organic chemistry, the subject he taught her. 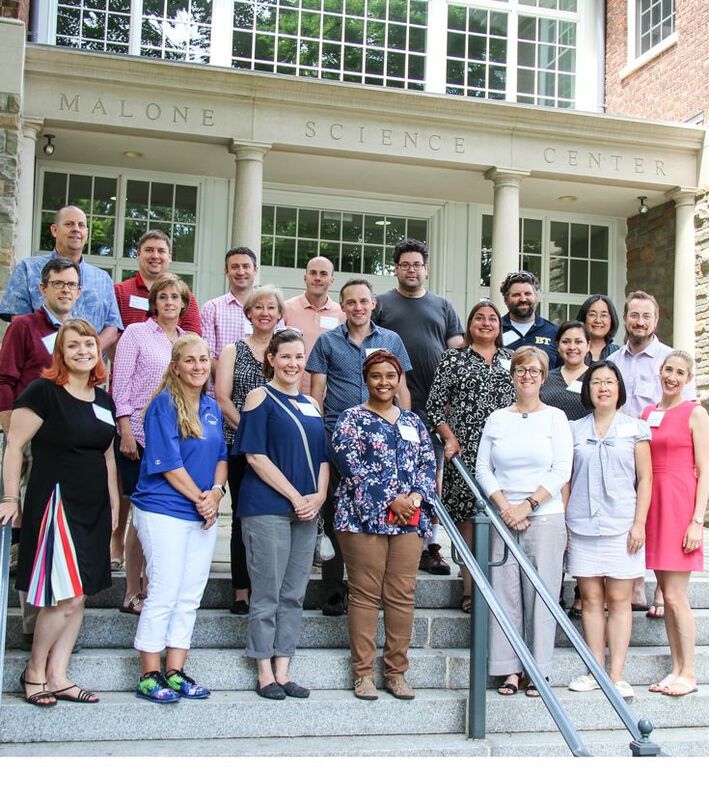 Photo: MSON faculty from around the country gathered on the Hopkins campus in June 2018 for their annual conference.